What is the need for Data Enrichment? The challenges that customers face to source external data are quite a few. Customers would not know whether the data that they require exists and they also would not know how and where to access this data. Even if they did find data, it would be challenging to identify which sources of data are reliable and can help their business processes. Also, this data could be unformatted, outdated, or cannot be extracted, which might all lead to lost opportunities for the customer. Sometimes customers have a lot of data that they have accumulated over the years, but they do not know what to do with it. Another scenario is when customers have the data but do not know how to share and collaborate across multiple lines of businesses (LOB) within their company. Different LOBs in some companies have different contracts with the same data vendor leading to higher total cost of ownership. Apart from this, third-party data providers have a requirement to get connected to existing and new S/4HANA customers. There is also a need to on-board third-party data in a streamlined manner into S/4HANA or systems other than SAP systems. Customers who have latent data in their systems have a need for external or third-party data that would enrich this data in their systems. What is SAP S/4HANA Cloud for Data Enrichment? 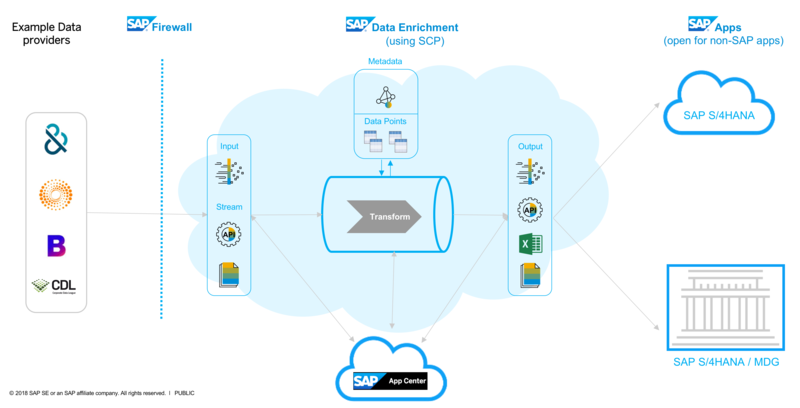 SAP S/4HANA Cloud for Data Enrichment also known as Data Enrichment is a plug and play capability to enrich master data in SAP applications using third-party data. Users need to sign up and connect to start using third-party data. Data Enrichment is a business service built on SAP Cloud Platform. It uses the agent model and uses SAP App center as one of the sales channels. Data Enrichment would offer pre-built integrations to SAP applications, starting with S/4HANA Cloud, On Premise, and Master Data Governance applications. What are the main features of Data Enrichment? Aggregated View: Using this feature, customers can subscribe to all or a subset of attributes provided by third-party data providers. Customers can define data views or aggregated views that act as templates for data query and consumption. Search: This feature helps customers to fetch match results from third-party data providers using fuzzy match algorithms. When the customer searches with some criteria the search service returns records corresponding to the search criteria and results are shown with a search score. Read: This feature helps customers receive the complete record from third-party data and results are used to create master data. The record that is read can be used to view or create master data in the consuming system. Data Consumption: Using this feature, consumption of data can be metered for the usage of each data provider that the customer has subscribed to. Customers can view the date on which the record was consumed and also the aggregated view that was used to consume the data.